HIGH CONVERSION EFFICIENCY: Constructed of high-efficiency monocrystalline solar arrays, convert up to 20.5%-22.5% of solar power into free energy, provide enough power to charge your device. FOLDABLE DESIGN: Ultra compact of size 16.5*11.0*1.2inch(folded)/35.5*16.5*0.3inch(opened) and it looks like a briefcase when folded. A handle for easy to carry, 4 metal reinforced mounting holes at each corner allow easy attachment to backpacks, trees, or tents. HIGHLY DURABLE: Industrial-strength PET polymer faced solar panels sewn into a rugged polyester canvas offer weather-resistant outdoor durability, great for any outdoor activities such as camping, climbing, hiking, picnic. DUAL-PORT AND MC4: Equipped with a USB 5V/2.1A(max) port and DC 18V/2.7A(max) port, one for USB-charged devices and the other for 18V powered devices. Also with a 55-inch MC4 connection cable, you can connect to the solar controller to charge your 12-volt battery, or connect to a solar generator for charging. POWERFUL AND PORTABLE: This solar panel packs 50W of power, but it only 1.2in thick and weighs only 3.0 lbs(1.35kg), making it easier to transport, hang, and remove. Let the Solar Energy Up Your Equipment! Why Choose Monocrystalline Foldable Solar Charger? 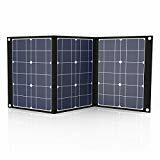 The foldable solar panel is designed for travelers, with high durability and portability, it’s the perfect companion for all outdoor activities. When you’re outdoors and enjoying nature, you can also enjoy clean and free solar energy by placing the solar panel under direct sunlight. Compared with other solar chargers, in addition to the MC4 connector, it also comes with a USB and DC port, you can use it to charge your mobile device. Ultra-lightweight and portable design makes it very easy to carry, while 4 mounting holes at each corner allow easy attachment to backpacks, trees, or tents, making it perfect for travel, camping or other outdoor activities. Our panel is mainly designed for charging 12V batteries or other 12V devices, applicable for RV, boat, yachts, car, trucks, trailers, etc. And the included USB port and DC port add some convenience, you can use it directly to charge your mobile device when needed. 1. For better charging effects, please do not use dual-port outputs when using MC4 connectors. 2. While the polyester canvas provides some water protection, we recommend minimizing moisture exposure to protect electrical components. 3. Product has no accessories other than the included MC4 connector cable and dual-port, If you want to charge a laptop, you need to provide a charging cable, and check the voltage, current, and power of your laptop adapter to ensure compatibility before using.